100 minutes about the American "Summer Pulling Tour" 2007. Shows you all the great Tractors running the Grand National and State National level in the USA. In the classes Super and Pro Stock, Unlimited Modifieds, Big Rigs, TWD`s, Minis and Modifieds. 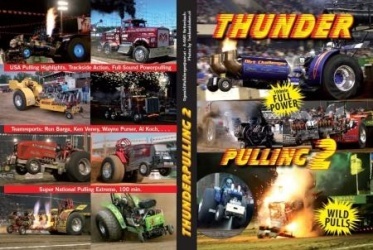 Interviews and reports from Stars like Ron Bargas The Judge, Wayne Pursers Uncle Sam, Brent Paynes Color of Money, Blue Blazes Ford SS and much more, gives you background informations and a good view of the high performance pulling machines. Thunder Pulling 2 covers the best action from 6 different American events and lets your pullingheart beating higher.